Fourth-grader Ella Kurschinske and fifth grader Daymire Spencer, both of Stowe, join instructor Erin McAuley of Gemini Children’s Theater. 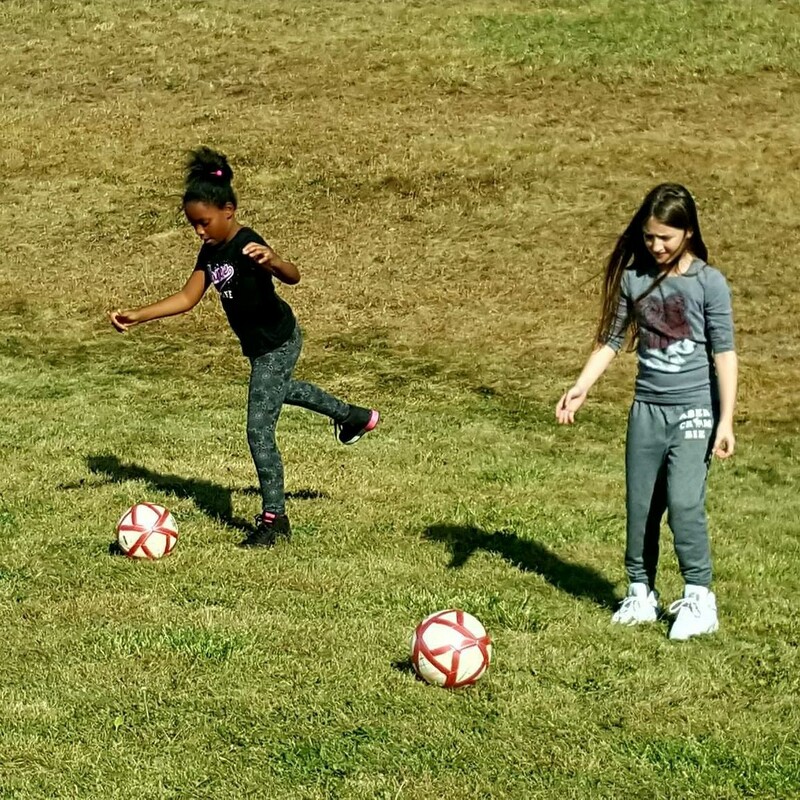 Fourth graders Deasia Rice of Stowe and Arianna Johnston of McKees Rocks practice soccer drills. Students at the Sto-Rox Upper Elementary school are putting in extra hours with the start of a new program which provides transportation home from after-school activities and homework help sessions. “We are working hard to develop the whole child by providing opportunities beyond the traditional classroom,” says Lori Sims, Sto-Rox Elementary Schools principal, who indicates the benefits of the program are many. “The children get an opportunity for new experiences, find their hidden talents, and create bonds with the teachers and other students. This bond gives the students the confidence needed to be successful and reach their full potential,” says Sims. The new programming emulates a much smaller pilot program that was coordinated last spring by members of the Sto-Rox Youth Partnership and through a grant provided by the McKees Rocks Area Rotary Club. The success of the pilot program paved the way for then Coro Fellows Reena Naik who worked directly with McKees Rocks Community Development Corporation and the Youth Partnership and Brian Rhindress who was assigned to the school district to write a grant request. The two applied to the Pittsburgh Foundation requesting funds be made available to expand the program and were awarded $33,500 to be used over a two year period. About 60 Sto-Rox students in grades 4-6 are currently benefiting from extra help on their homework while reaping the benefits from being exposed to activities they’ve not experienced before. Students are continuing to sign up as word spreads between friends. “I never had the chance to play soccer or golf before. I like learning new stuff and playing games [after school], says Aerial King, a fifth grader. Students are learning to act through Gemini Children’s Theater, golfing at First Tee of Pittsburgh, burning off energy with the Western Area YMCA or through other sports/dancing, focusing on creative writing, publishing the Viking Voice student newspaper and much more including an art club and athletic training. The Viking Voice will have an impact outside of the school community as it is being published in partnership with Focus on Renewal through a grant from Ohio Valley Hospital Plans are to create a Focus On Renewal community calendar and have copies of it and the newspapers available throughout the community. “I am very excited we are able to introduce students to new things and provide something for them to do after school. We started last year with two programs and now we are able to offer 11,” says Lisa Williams, teacher. And while the extracurricular activities are welcomed by both staff and students alike, the most important part of the program is having extra time for students to work on their homework while having teachers on hand to help with the difficult problems, says Head Teacher Heather Johnston. Academically, the extra help allows students to finish homework that might not otherwise be completed, she says. Rhindress and others look at this as an opportunity to not only keep students engaged and experiencing new things, but also as a way for partners in the Youth Partnership to advertise their programs and get more families engaged. A long-term vision for this program includes coordination with other Youth Partnership providers to bring more opportunities to the children and the expansion of the current after school transportation to allow students attending activities within the district to be able to catch a ride home. Currently, the after school bus stops at the Sto-Ken-Rox Boys and Girls Club to drop students off, but could also be used to transport students enrolled in activities like the Teen Studio Sto-Rox programming available at Ryan Arts and Cultural Center where students learn about video production, printmaking/branding, dance, culinary, ceramics and more.